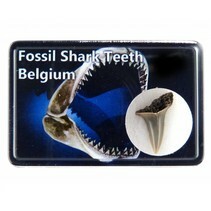 Very nice shark tooth is of the extinct Megalodon shark. The Megalodon shark was a giant among the predatory fishes. He could reach a length of 18 meters and had sperm whales and other cetaceans on his menu. The sharks appeared about 18 million years ago and most likely died out 1.5 million years ago. The Megalodon shark lived in all major oceans. This tooth was found in the Edisto River in South Caroline USA. The river is known for its wealth of fossils and in particular Megalodon teeth.